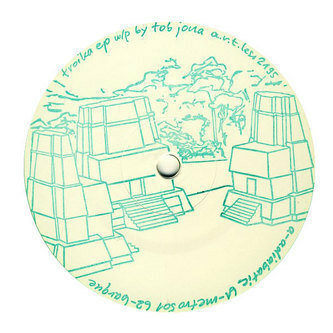 The steady stream of quality Berlin/Detroit gear delivers this beauty from relative unknown Tob Jona for the infallible Mojuba related A.R.T.Less imprint. Tob may be familiar to some of you for his work in Sounders Department with Mike Gerald, whose 'Cosmopolitan' track from 1997 was recently unearthed for an inclusion on the best installment of Styrax Records In Loving Memory series, in the meantime Tob has produced the spectral strains of the 'Troika EP' with three floor dedicated cuts of deepest House/Techno. 'Adiabatic' occupies the A-side with a deep tripping spectral techno vbe focussed around a modulated lead line that will burrow deep inside your head and take over the controls when heard at the right volumes. The flipside however contains two far more developed and interesting cuts in 'metro 501' and 'Barque' with respectful nods to Convextion and Newworldaquarium in its synth driven opulence and shuffling semi-broke-house-beats. Yet again the Mojuba fmily of labels keeps the quality bar tipping the red.